Last week we wrote that we would be attending the Gartner IT/Expo. We’ve settled-in full Disney style, and by that we mean with Mickey Mouse pancakes and Minny Mouse ears. With the partner reception last night we were excited to see our booth absolutely buzzing with activity — we met many interesting new people. 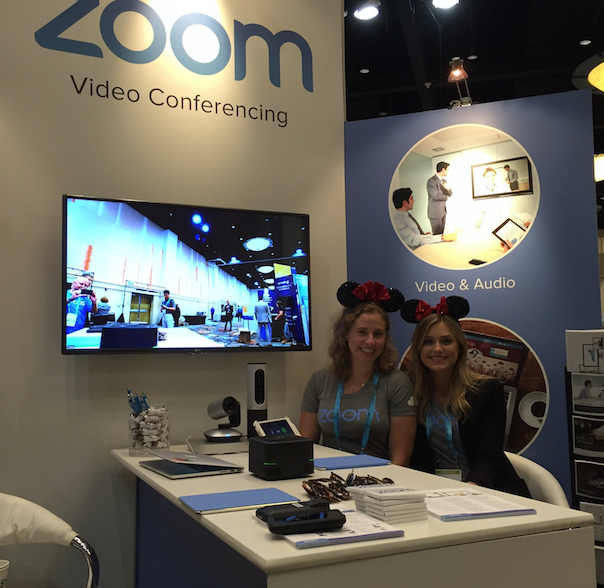 Many came to our booth to discuss cloud collaboration tech and how Zoom is different from all the rest, some came to learn about our innovative Zoom Rooms, and a few others came to discuss our mouse ears. We are a super friendly bunch. Let us wow you with our approachable demeanor, warm hospitality, and perhaps most importantly — our extensive knowledge of cloud collaboration. But don’t take our word for it; swing by booth 725 and we can prove it to you. We’re happy to answer any questions you might have. Thursday, October 8, at 10:15 am in Asia 2 — save the date! Our founder and CEO, Eric S. Yuan will be chatting with GoDaddy’s Jolean DeKort about her company’s hunt for a video conferencing solution. Jolean will discuss GoDaddy’s community-driven evaluation of 42 potential solutions, their decision criteria, driving end-user adoption, and how Zoom changed their business by supporting technology they already have in hand, including surprising outcomes for conference rooms and international teams. This session will provide a crucial roadmap for any IT professional looking to successfully implement new technology in their company. Mr. Hsieh will be keynoting on Wednesday, October 6, at 12:45 pm. As mentioned in our previous post, reading Tony’s book (Delivering Happiness) is part of a new employee on-boarding process at Zoom. We’ll be there, and we recommend you check it out as well! Hope to see you soon, but if you can’t make it, please set up a live demo with one of our product specialists today — it’s easy, quick and informative!